The Mack's Bible is based on over 15 years of personal experience in the realm of meeting, dating and seducing women. Many people claim to understand this "layer" of the Game but, they only have bits and pieces of it. For the first time a clear guide has been written. This book will walk you step-by-step through everything you need to know to be more effective with woman. From point A to point Z - I will teach you how to walk, talk, dress, improve your confidence, lead, manage and how to have multiple women at the same time (if that's your thing). The core of Macking is about manhood. This book will not teach you how to ACT like a better man - it will teach you how to BECOME a better man. Click the PDF icon to download the PDF file directly to your computer or device. Revealing the Secrets of the Game is the ultimate guide to self-empowerment. Unleash the greatness within you. Learn what the Game is and how to Play it. This book walks you step-by-step through the process of changing yourself from a Weak force in life to a Dominant one. I was hesitant on releasing this book because when the Game is used unethically it can make people do things that are not in their best interest. And to be even more honest, this book may not be for you. This book isn't about "positive thinking" or "positive affirmations". This book is about getting inside of yourself and becoming more effective in every area of your life. This is done through brutal honesty and accepting how the World really operates. Scroll down to download a free Concentration Chart which can be used with Lesson 5 of the book. 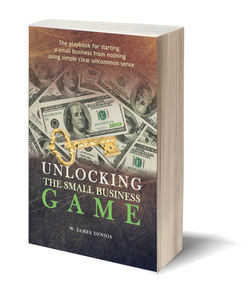 Unlocking the Small Business Game removes the complexity and "stuffiness" out of learning business concepts. I show you how to start a home based or small business from nothing - the same way I did. Business operates in the real world, so to understand how business works, doesn't it make sense that using real-world principles can make that easier? You will not find this information anywhere else. This isn't a sales pitch, I'm very serious. See for yourself - download your free preview now. ﻿Click the PDF icon to download the PDF file directly to your computer or device. Ho﻿lding Magnetic Conversations is an easy, simple, fast and effective way to greatly improve your communication skills. I used to hate talking to people, it wasn't until I was nearly 20 years old that I figured out that I simply didn't know how! One of the most important skills you can have here on this planet and yet it is never thoroughly taught in school. I made it one of my goals do discover the secrets of effective communication and I have laid them all out here. You will learn to talk to anybody, anywhere and at anytime. A focused and concentrated mind is essential to a mind of Dominant Force. This chart is simple and print ready. This is a redesigned version of the same chart I used when I first learned the powerful art of concentration. Just tack it on a wall or place the print in a picture frame and stand it up anywhere.